High performance tires designed specifically with the American V-Twin rider in mind. Newly developed compound (rear) and profiles offer the optimal balance of handling, mileage and rider comfort. Optimum tread pattern for high powered American V-Twins with attractive diamond cross deco-groove. Carcass designed for easier steering and improved ride quality for long distance riding. 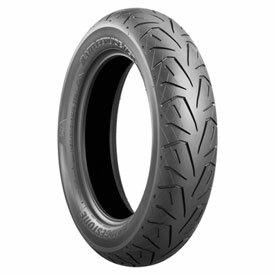 Compares to: Dunlop American Elite, Michelin Commander II, Pirelli Night Dragon, Metzeler ME880/888. So far it’s a good tire with good grip. I’ve got about 1000 miles on this tire (150/80-16) so far. I am using it on my Harley’s davidson Dyna Superglide. My Dyna Has a built engine and is Purpose Built to smash Canyons and Mountain roads. So far this tire has held up well. I purchased it because I needed a tire with better grip than a Commander 2 but I also need it to last a long time. The Bridgestone website said this tire lasts 2.7 times longer than their Excedra tires. If I can get 8000 miles out of this tire I’ll be very happy. We will soon see because I ride everyday.